On February 25, 2018, about 0810 eastern standard time, an Airborne Windsports Edge XT-912-L, N98YW, was substantially damaged when it impacted the ground while on approach to Mid Florida Air Service Airport (X55), Eustis, Florida. The sport pilot was fatally injured. The weight-shift-control aircraft was operated under the provisions of Title 14 Code of Federal Regulations Part 91 as a personal flight. Day, visual meteorological conditions prevailed, and no flight plan was filed, for the local flight which departed from X55, about 0804. According to witnesses, the pilot had recently purchased the weight-shift-controlled trike , from an individual in Hawaii. On the day before the accident, the pilot spent most of the day assembling the trike. The next morning (the day of the accident), the pilot taxied the aircraft to runway 18, where he then made three takeoffs and three landings within the length of the runway, each time taking off, climbing to a point about 30 ft above ground level, then descending, landing, then taking off again. The pilot then taxied back to the beginning of runway 18 and performed two more short takeoffs and landings. Then, while performing a third takeoff, instead of descending and landing again, he added power and joined the traffic pattern. The trike was next seen on the left downwind leg of the traffic and was observed to overshoot the turn on to the left base leg. The trike then turned on to the final approach leg of the traffic, but once again overshot, rolling out past the centerline which placed the trike to the right of the runway centerline paralleling the final. The trike then made a hard-left turn towards the final approach leg of the traffic pattern, and the wings of the trike began rocking up and down. 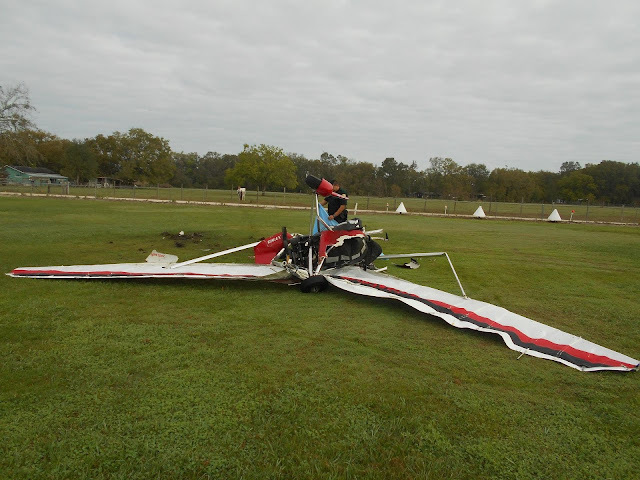 The right wing then "went down," the engine was heard to accelerate, and the trike impacted the ground. Initial examination of the accident site and wreckage by a Federal Aviation Administration (FAA) inspector revealed that the trike had impacted the ground on airport property, north of the runway 19 threshold, to the right of the extended centerline, in a nose low, right wing down, attitude. The recorded weather at Leesburg International Airport (LEE), Leesburg, Florida, located 10 nm west of the accident site, at 0753, included: winds 180° at 6 knots, 10 statute miles visibility, overcast ceiling at 8,500 ft, temperature 22°C, dew point 20°C, and an altimeter setting of 30.20 inches of mercury. According to FAA airmen records, the pilot held a sport pilot certificate with an endorsement for weight-shift-control-land aircraft. He also held a repairman light sport aircraft certificate. According to FAA airworthiness records, the trike was manufactured in 2009. EUSTIS – Authorities on Monday identified the pilot of an ultralight that crashed while approaching Eustis Airport Sunday morning. According to a report released Monday, a witness said John Farmer of Orlando had been doing touch-and-go’s on the airport runway with his red and white Trike ultralight just after 8 a.m. Sunday and then flew south away from the air strip. The witness said Farmer made a final approach back to the airport but crashed beyond the tree line. The witness, Russell Smith, rushed to the scene and found the plane overturned on top of Farmer. He and a worshiper from a nearby church lifted the plane off him. Smith said he cut the pilot out of his harness and began doing CPR. A Lake County Sheriff’s deputy arrived at the scene and said it was clear Farmer was dead. Farmer was 47. The Federal Aviation Administration, which was called in to investigate, has identified the plane as a XT-912 Tundra Arrow Ultralight . Smith said while he didn’t see the crash, he never heard the engine cut out. He speculated that the aircraft stalled, meaning that the fabric wings weren’t getting enough lift even if the engine was still running. That can happen with any aircraft, he said, but with an ultralight flying so low to the ground, there is little time to recover from a stall and the result can be fatal. “If you don’t have lift and gravity is pulling you down, then you’re basically going 150 miles an hour into the ground,” he said. Smith also said the drafts can be tricky around that airport, especially around the tree line. A 47-year-old man died this morning after he crashed a red-and-white “trike aircraft” near the runway of a general aviation airport in Eustis, the Lake County Sheriff’s Office said. Deputies arrived 8:10 a.m. to the scene at 19803 Eustis Airport Road and the man was pronounced dead just four minutes later. The man’s name has not been released pending notification to his next-of-kin. Russell Smith, a witness , told deputies he saw the ultralight plane doing “bunny hops,” bouncing up and down off the runway, Lake sheriff’s Sgt. Fred Jones said. Smith rushed to the wreckage to discover the plane lying on top of the dead man, Jones said. Jones said patrons from a nearby church came to Smith’s help, lifted the plane off the man and removed him from the cockpit. The man was found with a wallet, Samsung smart phone and two sets of keys, according to a deputy’s report. The Federal Aviation Administration has taken over the investigation. LAKE COUNTY, Fla. - A man was killed in a plane crash at 19803 Eustis Airport Road, officials said. The Lake County Sheriff's Office said deputies arrived to the scene to find an overturned red and white Trike aircraft and a body laying nearby. A witness, Russell Smith, said he saw the plane hopping up and down on the runway before the pilot flew south, went beyond the trees and then he heard the plane crash. Smith said he ran to the crash site, where he found the pilot dead, laying underneath the plane. Deputies said Smith and a few other people from a nearby church lifted the plane off the victim. Sheriff's Office officials said the investigation has been turned over to the Federal Aviation Administration.